Cruz Blames His Supporters for Dirty Tricks, but Blames Trump for Violence | Virginia Right! Ted Cruz is a hypocrite. And he has proven once again he will say anything to get elected. The at-issue emails and social media posting was not sanctioned by the Cruz for President campaign. The campaign became aware of the email this morning by press accounts and upon investigation learned that some volunteers in Hawaii were involved in the posting. The individual(s) who sent this had no authority from the campaign to do so. The campaign’s counsel has contacted those responsible, who were in no way authorized by the campaign, and demanded that the material be removed and further use of official campaign logos for any purpose be terminated. 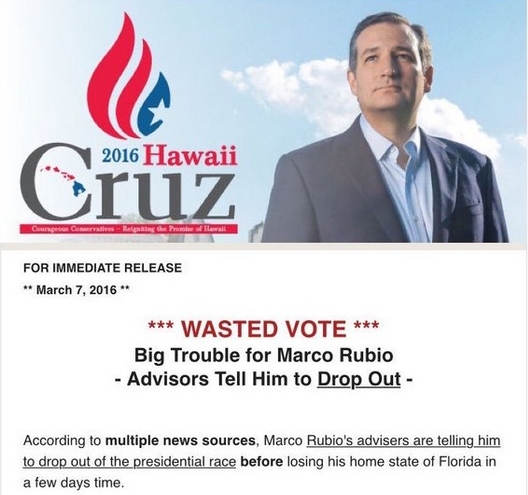 Ted Cruz Hawaii, for its part, claimed to be “officially sanctioned” by the Cruz campaign before its website was taken down. So Cruz passes the buck when it comes to his own campaign and blames his supporters who actually state their communications were officially sanctioned. Any campaign except his own of course. Ted Cruz is a hypocrite. Once and for all- Rafael Edward Cruz is not eligible to be POTUS- Born in Canada to a Cuban Atheist Father who fought for the Godless Communists- Castro. Really? Are you Tea Party activists so desperate that in a country of 330 Million People you want this Fraudulent Globalist Manchurian Candidate for POTUS? It was Ted Cruz who handed Justice John Roberts on a silver platter to George W. Bush. How’s Roberts’ 5-4 Obama Care is a TAX vote working out for you? You want Ted Cruz nominating any more Justices? Wake up- If Donald Trump ONLY performs one thing as President- BUILDING THE DAMN WALL- he will have done more to SAVE AMERICA than any president in the past 20 years. Finally- someone who understands who and what Ted Cruz really is- a puppet for Goldman Sachs. It was Treasury Secretary Hank Paulsen- a GOLDMAN SACHS EXECUTIVE- under President George W. Bush who oversaw the near Depression in 2008. Heid Cruz works for Goldman Sachs and it was Goldman Sachs who funded Cruz’s US Senate election. Heidi Cruz wrote the North American Union agreement for the Council on Foreign Relations- remember that super highway that was to connect Mexico to Canada? OPEN BORDERS? You Cruz Supporters are NUTS if you think old Ted isn’t a Globalist- he will never build a wall or deport the 14 million illegals in America- He is a product of Illegal Immigration. Yes Goldman Sachs was the real winner in the TARP bailout- took out their enemies and competition and George Bush and Treasury Secretary Paulson were there to oversee it. Cruz Supporters are just STUPID. He\’s a Globalist. Ask Alex Jones. blaming the announcement on Cruz is White’s uninformed rant. will give the national election to Hillary. Cruz can win the primary and the national. Cruz today is only 91 delegates behind Trump. Cruz can WIN and will get our country back to the way our Founders built it. Cruz will “Make America Better”. Well, that is simply untrue. Cruz is not a natural born citizen. The law of 1790 which Cruz and his blinded followers like to quote was repealed and replaced in 1795. And the children of citizens of the United States that may be born beyond Sea, or out of the limits of the United States, shall be considered as natural born Citizens: Provided, that the right of citizenship shall not descend to persons whose fathers have never been resident in the United States: Provided also, that no person heretofore proscribed by any States, shall be admitted a citizen as aforesaid, except by an Act of the Legislature of the State in which such person was proscribed. Note that the Cruz supporters stop reading this after the words “natural born Citizens”. But you always ignore the part that reads “children of citizens of the United States”. Citizens is plural. Mother and father. It takes 2 people to use the word citizens. Yet I see Cruz supporters throw this line out from a repealed law as if it still applies. Note that in 1795 the phrase “natural born citizens” now just says “citizens”. And it also specifically states that “the right of citizenship shall not descend to persons, whose fathers have never been resident of the United States”. But laws make no difference to Cruz supporters. Quite a few Cruz supporters were Obama birthers. They declared that they believed Obama was not born in the US, but in Kenya. Funny how none of you said at the time “but his mother was a US citizen. So he is natural born. Ted Cruz is not only a liar, but also a Canadian. Tom White recently posted…Hanover GOP Committee Commandeered By the TEA Party? Nonsense! possible lie that they stand behind and call it (incorrectly) a lie – the Carson issue. success of his failing companies, his complicated sale of his plane (repo), his stand on Planned Parenthood, his 100% ownership of a Golf Resort (FL), his business ties to the Russian Mafia, etc. Trump is the LIAR. Almost as bad as Hillary and Obama…both of whom have had contributions from Trump. This is very disturbing. When was it decided to conduct an \”experiment\” in the most influential presidential election in history? I tried to post the link but it doesn\’t work. Soros Board Member Chairs Firm Running Online Voting In Utah reported by Briebert.